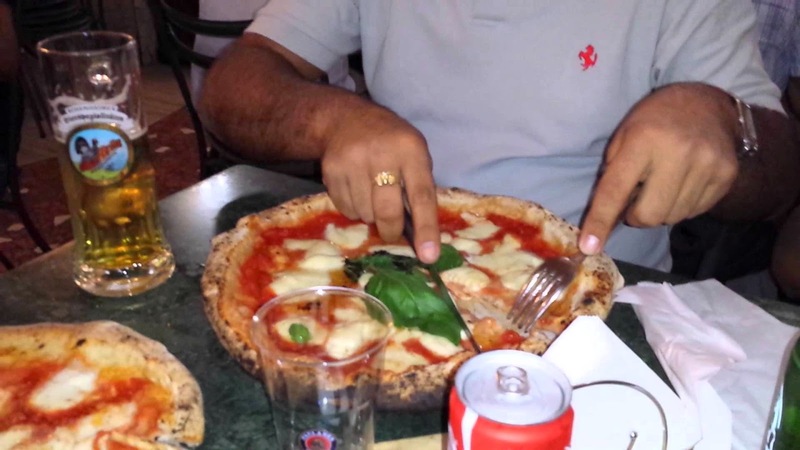 CHIAVARI, Italy – Ahhh, Naples, the Mecca of Pizzalandia. It’s a place where they take their food very seriously. So seriously they even got the European Union to pass a law stipulating how a pizza must be made, and what it must be made of in order to be called a Neapolitan pizza. The number one qualifier is the crust; it has to be soft and light. To get to that quality of texture the dough must be made the day before and allowed to rise for at least 10 - 15 hours. Then it’s up to the pizzaioli, or pizzaiuoli in Neapolitan dialect, to work his magic. It is a craft that must be learned. In most cases it takes at least two to three years of apprenticeship just to learn how to handle the dough. It’s not as easy as it looks. Neapolitan pizza is not finger food. The centers are goopy, slightly undercooked, and you need a knife and fork to eat it. Pizza served in Italian pizzerias are about 8 or 9 inches across, individual size, and even if they don’t have a goopy center Neapolitan style, you still eat them with a knife and fork. The only pizza you pick up and eat is the pizza you buy on the street. And even then, it comes wrapped in paper so your hands never have to touch the slice. Under the pizza law, unless a pizza is cooked in a wood-burning oven, it can’t be called a Neapolitan pizza. But then again, no self-respecting Neapolitan pizzeria would cook their pizza in anything but a wood-burning oven. Pizzas cooked in that blazing heat cook fast, 60-90 seconds, and taste better. It’s a very old method of cooking food and the traditional wood-burning ovens you see today are based on designs handed down from the Romans. It’s hard to believe now, but for a long time tomatoes were thought to be poisonous and were only used as ornamental plants. But somehow the pomo d’oro, which eventually morphed into pomodoro (tomato), found its way into pasta dishes and toppings for the flat breads that were already being sold in the streets of Naples. 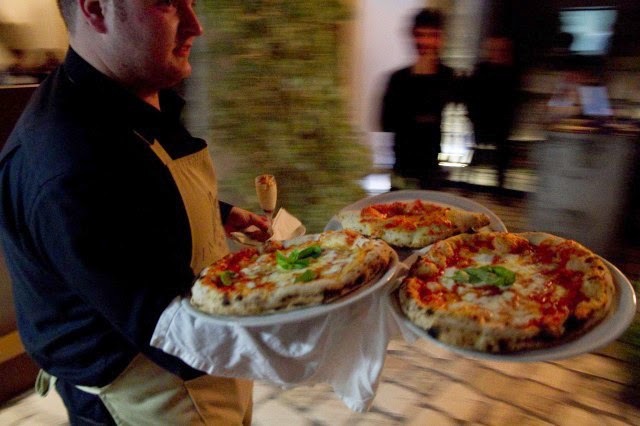 The pizzas were baked in ovens and then sold by “scugnizzi pizzaioli”, street urchins, usually poor kids who only went to school when they had to. They worked for the pizzerias, earning pennies hawking pizzas in the streets and piazzas of Naples. The pizzas were kept warm in a tin stove, a “stufa” that they balanced on their heads. About that same time, the early 1800’s, the wives of local fishermen had started making pizzas to feed their husbands before they set out to sea. Along with tomato sauce the wives would add olive oil, oregano and salt. If they had a little meat, cheese or sardines they would add those as well, but the basic pizza was sauce, oil and oregano and it became known as pizza marinara. In the Pizzaria Brandi there is letter dated June 1889 that has been framed and hung on a wall. 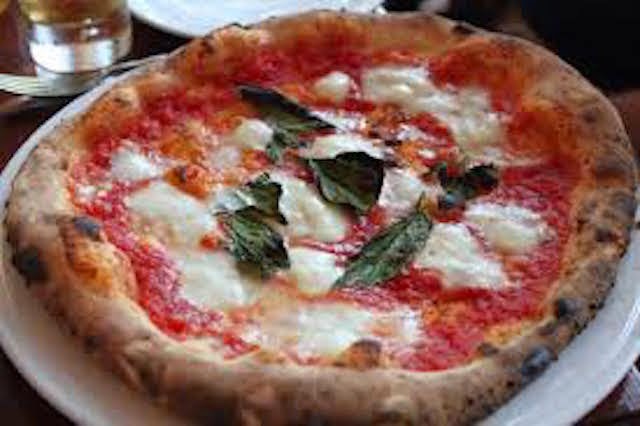 It is from the head of the Royal Household of the House of Savoy thanking pizzaiolo Raffaele Esposito for the excellent pizza with tomato sauce, mozzarella and basil he prepared for Her Majesty, Queen Margherita. And the rest, as they say, is history. Pizza Marinara and pizza Margherita are still made and sold in Neapolitan pizzarias – and pizzarias around the world. But it’s a little unfair to call them pizzarias in Naples for like Pizzaria Brandi, which has been around since the late 1700’s, they are Pizzarias with a capital P, the keepers of local traditions. The 114 year old Starita is another capital P Neapolitan pizzeria. In 1901 Alfonso Starita opened a cantina and began selling wine. It wasn’t until 1933 that Guiseppe Starita, one of Alfonso’s eleven children, started selling food along with the wine. About five years later, pizza was on the menu. 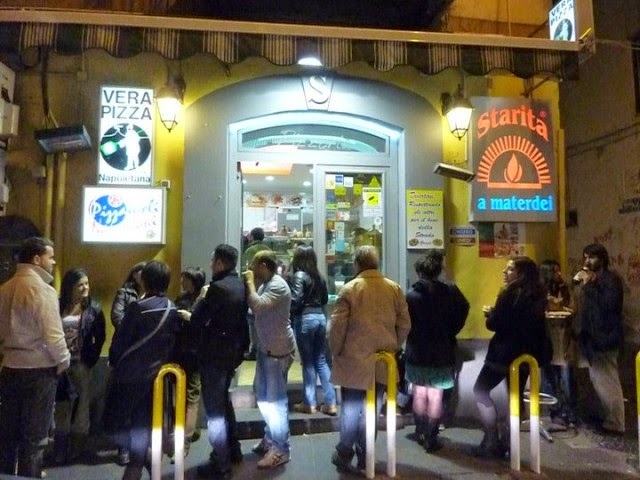 Locals have always known about the quality of the pizza at Starita, but it was Sophia Loren, who sold pizza here in the 1954 classic film L’Oro di Napoli or The Gold of Naples, who introduced it to the rest of the world. 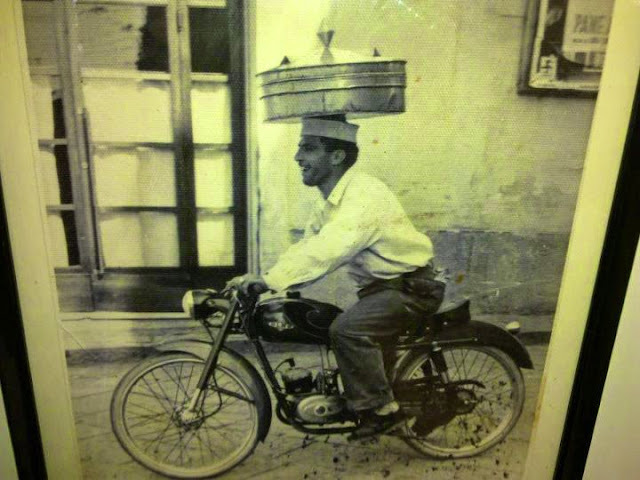 Many of the pizzerias in Naples started out as friggitori, little fast food places with walk up windows where you buy stuffed rice balls (arancini) or fried sardines and other fried treats. There are still plenty of friggitori/pizzerias in Naples. One of the best is Il Pizzaiolo del Presidente – so named after President Bill Clinton ate there. DiMatteo is another. One of the specialities at DiMatteo is called a portafoglio – wallet. It’s an eight-inch pizza with a springy crust folded and re-folded over a tasty topping. You’ll also find portafogli on the menu at Pizzeria Port’Alba, the oldest pizzeria in Naples. It too started out as a friggitori back in 1738. About a hundred years later it became a pizzeria. If your family is from Naples, and you are in town, you might want to make a stop at the Pizzeria Port’Alba for chances are someone in your family ordered pizza from this place long before they immigrated to America, and it’s nice to carry on family traditions. In the heart of Spaccanapoli, the historic center of Naples. Signore Ernesto Cacialli, a pizzaiolo since he was 7, invited former US president Bill Clinton – who was in Naples in 1994 for the G8 – to taste his pizza. And that is how Signor Cacialli became known as the Pizzaiolo del Presidente, the President’s pizza maker. This is the oldest pizzeria in Naples and Italy. 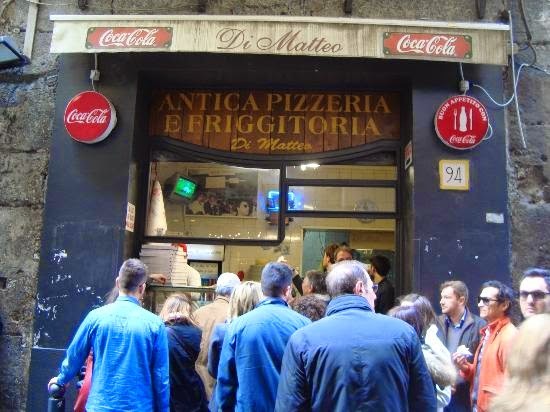 Founded in 1738 as seller of street food, it became a real pizzeria in 1830, and is still run by the same family. Fifty years ago Raffaele Marigliano created an amazing pizza with alici (anchovies) and cicinielli, tiny fish just past the larval stage, also known as bianchetti. If you are not a fish eater try the pizza fritta, a deep fried pizza with ricotta cheese, provola cheese, tomato sauce and sugna (lard). It was in 1933 that Giuseppe Starita, one of Alfonso Starita’s 11 children, came up with the idea of adding food to the wine cellar his father had opened in 1901. Giuseppe and his wife Filomena started serving simple dishes like bean soup, fried anchovies, fried cod and tripe all served with homemade wine. It wasn’t until 1948 that it became a pizzeria friggitoria. In 1889 Brandi’s pizzaiolo, Raffaelle Esposito, was asked to make three pizzas for King Umberto 1 and Queen Margherita. Margherita picked the simple tomato, mozzarella and basil pizza as her favorite. I’ve often wondered what the other two pizzas tasted like. We just visited Naples last month. Had a great pizza but it was the topping that made it. The centre was soft and a bit chewy but the combination of tomato, buffalo mozarella and basil was sweetly perfect.